In this comprehensive report, we will dive into the differences between the many different types of drinking water to determine which is the best for your particular circumstances. Water is necessary for life. Our bodies are mostly made up of water and doctors have been telling us for years to drink eight glasses of water a day. Water contains vital minerals that we need to stay healthy and strong and many people would be surprised to learn that the hydrating effects of water can help us lose weight, stay healthy, reduced disease, reduce the occurrence of many headaches, and improve our overall wellness. If you make a habit of drinking eight glasses of water a day, you’ll be amazed at how good you feel. But when you reach for a glass of water, do you give any thought to what you are drinking? You should. Studies are showing that our bodies need a variety of things from water… and frankly, we just aren’t getting them. Even water run through various treatment methods can be ineffective at killing bacteria or cleaning out impurities… and some of them even take out the good things we need in water! So when you choose water to drink, how do you know which water is the best water for you? After all, there are so many water purification methods out there that it is difficult to know which one is actually providing the best water. In this report, you will learn the three ways to review water. You will see each water treatment method reviewed in detail according to the criteria. And you will find a table at the end that effectively summarizes the review in an easy-to-read format. Water Purity: How free is the water of contaminants and impurities? While most municipal water systems in North American are free of harmful bacteria, they are by no means free of chemical residues, heavy metals, chlorine by-products, and other microorganisms. Contaminant levels are measured by a lab test. Water Acidity: Is the water alkaline enough to help balance our bodies’ tissues – which are already overly acidic? This is measured by a simple “pH” test. Water oxidation: Does the water have an oxidizing or anti-oxidant effect on the body? Oxidants speed up cell degeneration while antioxidants prevent it. (Think of it this way: it’s actually a lot like how rust works). The standard here is the water found in quick flowing mountain streams – a natural antioxidant. The antioxidant property of water is measured with an O.R.P. meter (Oxidation-Reduction-Potential). Mineral Source: Healthy water should contain many minerals, including calcium, magnesium, sodium, potassium and trace elements. These are vital to a healthy life. Mineral content is measured by lab analysis. Our bodies need fewer contaminants and bacteria than we’re getting. Our bodies need water that is more alkaline than we’re getting. Our water needs to be anti-oxidizing… and we’re not getting that either. And our water needs to be a source of minerals, but many common water treatment systems strip those minerals from the water! This is the most subjective criteria, but there are broad areas of agreement. How many years to pay back the initial cost of the appliance or filter? Do you include cooking water as well as drinking water? How much electric current does it use? How often does one have to buy a new filter or perform other maintenance? We base our comparisons on a 2-year payback period, for a family of three, using 5 liters (quarts) of water per person per day (cooking and drinking). So there will be one estimate of cost during the first 2 years, and another estimate for the 3rd and successive years. Estimates are expressed in US $. In most of this discussion, we will focus on tap water from your local (municipal) authority, since waters from private wells can vary so widely. For more information about determining the safety of your private well. Tap water contains various contaminants in levels permitted by the local authority, with overall guidelines set by the federal and local governments, for example, the U.S. Environmental Protection Agency and Health Canada. If you live in the U.S. you can learn about the water supplied by your local authority. In larger doses, the harmful effects of many of these contaminants are well-established; many are carcinogens. However, the long-term effects of drinking these contaminants at permitted levels are either not known, not been thoroughly researched, or are thought to be harmful — but still controversial. There can be over 2000 contaminants in a glass of water. As mentioned earlier, properly treated municipal water and water from tested wells are generally free of harmful pathogens such as e.coli, and various protozoans. That said, there is still generally present in most tap water, varying levels of non-pathogenic bacteria, cysts and viruses. For a complete list of common contaminants that are found in drinking water and what the acceptable levels are and what you might be able to do to reduce them, NSF has a handy guide to water safety. the U.S. National Resource Defense Council recently found that 43% of all water systems (affecting 120 million people) violated federal health standards. And, if you live in the country, run-off from farms, mining operations, and feedlots may be lacing your well water with carcinogens like pesticides and nitrates. Tap water can range from acid to neutral to mildly alkaline (pH 4.3-7.7), which means it can either add further acidity to the body or in some cases be very mildly neutralizing. Municipal tap water has no antioxidant properties, in fact, is strongly oxidizing. Any antioxidant properties that may have been present in its original natural sources have been dissipated through contact with environmental pollutants, plastic, and metal pipes, and the municipal treatment process. Municipal tap water contains sodium, potassium, calcium, magnesium and trace minerals in small amounts; however the calcium and magnesium are chiefly in the form of carbonates, often added to the water after the chlorination process. These carbonates are less available to the digestive system. Unfortunately, acid minerals, such as sulfates and chlorides are in equal supply. The taste of tap water is often “sour” due to the presence of chlorine and acid minerals. The cost of tap water is the lowest. In municipal systems, it can be as low as one-tenth of a cent per liter (quart). Boiling is a useful method for killing bacteria and other living organisms during emergencies but is not recommended for long-term use. 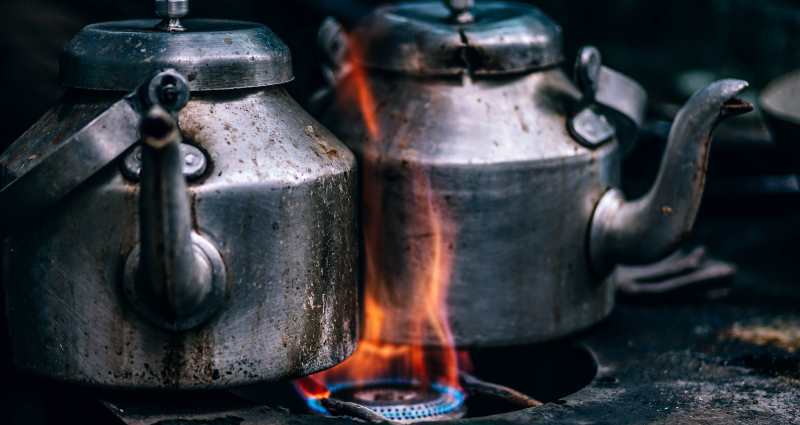 Boiling may kill germs, but dirt, sediment, dissolved solids, bad taste or odor remain – as well as possible chemical contamination and acidity. There are two broad categories: mechanical filtration and fine filtration. Fine filtration is generally of two types: activated carbon (charcoal) or ceramic. There is an enormous range of quality, from inexpensive tap-mounted or pitcher filters in the $25 range to high-end filters costing $425. Activated carbon (charcoal) filters account for most of the filters sold domestically since they are inexpensive and simple to install. They can remove Cryptosporidium and Giardia, and varying amounts of chlorine products, as well as sour taste and bad odors. However, depending on the type of carbon used, they may leave heavy metals – such as arsenic, copper, and lead, as well as volatile organic compounds. The more solid the carbon is, the greater the effectiveness of removing these latter contaminants. Sometimes a silver coating is used to inhibit the growth of bacteria while the water sits in the filter. In the better systems, an average filter will last 6-10 months. In the less expensive systems, filters need more frequent changing. If a carbon filter is not changed regularly, it can become a breeding ground for bacteria, and stop being effective against the removal of trihalomethanes (a chlorine by-product). Limitations of carbon filters: A properly designed carbon filter is capable of removing many toxic organic contaminants, but falls short of providing protection from dissolved solids, nitrates, high sodium and fluoride levels. Only a few solid block filters have been certified for the removal of lead, asbestos, volatile organic chemicals, and cysts. Faucet-mounted carbon filters: many are ineffective at removing volatile organic compounds, and typically offer no additional control of microorganisms. Although the least expensive of filters, they require frequent replacement. Pitcher type/Pour-through filters: Most reduce only a small number of organic contaminants. Limited water volumes. Frequent filter change is required. For a comparison of carbon filters, see this guide that includes pros and cons for each type of water filter including various brand names. Ceramic filters: Ceramic materials are compressed into a densely packed arrangement, blocking the migration of particles smaller than 0.2 to 0.3 microns. These are useful for removing bacteria from unsafe water supplies, asbestos, and cysts. However, ceramic filters cannot reduce volatile organic compounds, trihalomethanes, mercury or lead. When combined with carbon filters, these systems become even more effective in dealing with contamination problems (i.e. bacteria plus organic chemicals). Acidity/Alkalinity: Filtration does not significantly affect the pH (acidity or alkalinity) of the source water. 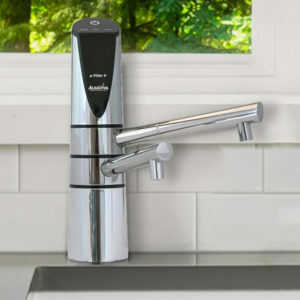 Antioxidant Properties: Oxidizing; there are no antioxidant properties in filtered water.Taste: Carbon filters improve the taste of municipal tap water by removing chlorine and, in some cases, other organic compounds. Off-taste in well-waters, often due to the presence of iron or sulfur, will not be thoroughly filtered out by carbon filtration. In this case, further, specialized pre-filtration is required. Many people swear by bottled water as an alternative to their tap water. But there is a huge variety in quality. Bottled water includes many labels: spring, artesian, mineral, drinking, purified, filtered, demineralized, distilled and others. Spring water is derived from an underground formation naturally flowing to the surface. It must be collected only at the spring. Most spring water undergoes filtering or purifying processes before bottling and does not retain minerals. Mineral water contains no less than 500 ppm (parts per million) dissolved mineral solids. The dissolved minerals must be present at the source and may include calcium, magnesium, potassium, fluoride, sodium, silica, chlorides, bicarbonates, sulphanates and iron. No minerals may be added to this water. Demineralized water generally refers to treatment by reverse osmosis. Unlike tap water, which is regulated by federal guidelines, bottled water is much more sparsely regulated, with manufacturers typically operating under an honor system. For example, no standard requirements exist to test bottled water for certain parasites, such as Cryptosporidium or Giardia; standards to test for these do exist for tap water. 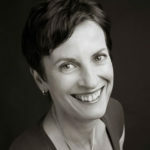 There is no assurance that just because water comes out of a bottle it is any cleaner or safer than water from the tap. This was the conclusion of a 4-year study by the National Resource Defense Council. This 1999 study looked at the difference between safety standards for bottled water vs. tap water. They tested over 1000 bottles of 103 brands of bottled water and found that some bottled water contains bacterial contaminants, synthetic organic chemicals including industrial solvents, and inorganic contaminants such as arsenic. A survey by the US Food and Drug Administration stated that 31% of the 52 brands tested were tainted with bacteria. Another concern is the low-grade plastic that most manufacturers use. This can leach toxins such as methyl chloride and xenoestrogens (carcinogens) into the water and into the drinker. When deciding between brands of bottled water, look for third-party certification from independent organizations such as NSF International, which makes regular, unannounced inspections. Antioxidant properties: No bottled waters possess antioxidant properties. Popular brands of demineralized bottled water have oxidizing properties often higher than tap water; while waters bottled from mountain springs are much less oxidizing, though still not in the antioxidant range. Mineral content: Speaking broadly, only the “mineral” waters have any substantial content of healthy alkaline minerals. Most bottled waters have calcium and magnesium levels that are low to zero. Acidity/Alkalinity: The vast majority of bottled waters test in the range from acid to neutral. However, there are a few mineral spring waters that are mildly alkaline; while these might not have a strong neutralizing action on acidic body conditions, they at least, in this regard, do no harm. Taste: a wide range of tastes but representing, on the whole, an improvement over tap water. There are also environmental costs associated with the production and disposal of plastic bottles and the shipping of water across oceans or continents. Water is passed through a pre-filter to remove fine particles, then applied under pressure to a membrane to remove inorganic minerals. The membrane can remove up to 98% of total dissolved solids, as well as bacteria and cysts. The water then goes through an adsorption filter to improve taste, odor, and color; and reduce chemical contaminants. RO systems vary widely in their ability to reject nitrates and chlorides. The impurities collected on the membrane must be flushed from the system. This requires between 4-7 gallons per gallon of treated water. Their performance is affected by water pressure (high pressure is required), water temperature, pH, bacteria, dissolved solids. A residential system can produce anywhere from 1 to 20 gallons per day. Output times vary: small units can take up to 24 hours to process 5 gallons. Water is generally made by the “batch” and stored in a sealed container. Usually installed under the sink, they often require a serviceman to come every few months to install a new membrane. As with all treatment systems using a carbon filter, this requires regular replacement. RO removes bad taste and odor, herbicides/pesticides, chlorine and THMs, fluoride, many bacteria and viruses, arsenic, lead, mercury, cadmium, aluminum, calcium, magnesium, sodium, and asbestos, leaving a very pure form of water. Although RO is effective in removing bacteria and viruses, it is not recommended that you rely on it solely if your water is contaminated with bacteria and viruses. In that case, ultraviolet treatment should be added. However, according to a study that appeared in “Applied and Environmental Microbiology”, April 1991, RO systems can under certain conditions act as an intensive breeding ground for bacteria. Minerals: reverse osmosis water is de-mineralized. It provides no calcium, magnesium, sodium, potassium or trace elements to the body. Because of this, mineral supplements are sometimes recommended. Unfortunately, reverse osmosis creates water that is highly acidic and oxidizing. Therefore it is not recommended for long-term drinking. According to Zoltan P. Rona MD, “Because it is free of dissolved minerals, it has the special property of being able to actively absorb toxic substances from the body and eliminate them. Studies validate the benefits of drinking RO water when one is seeking to cleanse or detoxify the system for short periods of time (a few weeks at a time). Fasting using (RO) water can be dangerous because of the rapid loss of electrolytes and trace minerals, deficiencies of which can cause heart beat irregularities and high blood pressure. However, RO units can be used where there are extremely high levels of mineralization in the water, or for farm wells contaminated with high levels of nitrate. Taste: Free of the sour taste of tap water; neither a poor taste nor a noticeably good taste. For further information on RO systems, visit the University of North Dakota study. Best Water carries RO treatment products and replacement filters. Distillers use electricity to heat tap water to the boiling point. Impurities are left in the boiling container and the steam – purified – condenses, and is collected in a clean container. Impurities remaining in the boiling chamber are either automatically or manually flushed out depending on the system. Some units have a final activated carbon filter. Distillers require a fair amount of electricity, about 3 kilowatt-hours per 4 liters (1 gallon), and cannot give immediate supply. Maintenance is the highest of all methods, chiefly because the tank requires frequent cleaning and occasional factory maintenance of the piping. Distilled water is made in “batches.” Air-cooled distillers produce 1 gallon for every gallon of tap water. Water-cooled units produce one gallon of water from 8-15 gallons of tap water. A typical unit may produce 4 liters (1 gallon) of water in 4.5 hours. Distillation will commonly remove 99% of all bacteria, chlorine, arsenic, aluminum, pesticides/herbicides, lead, copper, other heavy metals, sodium, nitrates, industrial solvents. Volatile organic compounds are not effectively reduced by distillation alone. Therefore a final “post” filter of carbon is used to remove these contaminants. Thus, distillation followed by carbon filtration gives a very pure form of water. Distilled water, as a result, is completely devoid of all minerals, including healthy minerals. In addition, to many people’s surprise, distilled water is acid, not neutral as one might expect. Typical pH ranges from 4.0 to 5.4 (neutral is 7.0). According to the EPA such water is termed “aggressive” water because of its ability to leach out minerals; as a result, it can be detrimental to the health of bones, teeth, and tissues. However, distillation is used in some situations where large amounts of minerals (e.g. in very hard water) must be removed to improve the taste. Some people periodically drink distilled water to aid in the dissolution of kidney or gallstones. A distiller can provide safe drinking water in times of emergency, for example following an earthquake, when a “boil water” advisory may be issued. Antioxidant Properties: Distilled water is highly oxidizing (no antioxidant properties). Taste: The removal of beneficial minerals results in flat tasting water. The cost of a small to medium-sized good quality home distiller is between $480 and $1700. Electricity costs average $300 per year. For a thorough look at the features and costs of water distillation units, see the report from the Univ. of Minnesota. Or if you want to check out the distiller that we recommend. Alkaline ionized water for drinking and cooking. Acid ionized water used for cleaning, disinfection, skin care & plants. Unlike reverse osmosis or distillation methods, which remove all minerals – leaving the water dead – ionization concentrates needed alkaline minerals in the drinking water and removes the unhealthy minerals to a separate stream into the sink. It also differs from these methods by providing water on an “on-demand” basis. (All distillers and most RO units are “batch” producers) A range of pH settings from neutral to very alkaline can be selected. The electrodes are cleaned in an automatic self-cleaning cycle. As with all treatment systems using a carbon filter, this requires regular replacement. Quality units range in price from $875 to $2095. Ionized water is rich in minerals: calcium, magnesium, potassium and trace elements. These alkaline minerals have a significant proportion in the form of hydroxide (more easily assimilated that carbonate). Its strongly alkaline property helps neutralize acid wastes in the body, and prevent the build-up of toxic acid conditions that can result in chronic disease. Ionized water is a powerful antioxidant (equivalent to fresh orange juice), the only water available with such a property, except for unspoiled mountain streams. Generally speaking, ionized water offers the healthiest choice of drinking waters, as it concentrates needed minerals, prevents the leaching of minerals from bones and teeth, and provides antioxidant assistance against the development of chronic disease. Taste: Sour taste is removed through carbon-filtration of chlorine and through the reduction of acid minerals in the water by ionization. In addition, the alkaline ionized properties give the water a “silky” taste. The result is water with superior taste. For more information, see our next generation ionizers. Ultraviolet water treatment uses UV light to disinfect (kill bacteria and viruses). A popular aspect of UV radiation is that it does not add chemicals to the water. UV treatment is effective in ridding the water of bacteria and viruses as long as UV light contacts 100 percent of the water. Since some pathogens are less sensitive to UV light than others, ensuring sufficient amounts of UV radiation can be difficult. It is important to remove all sediment before the water enters the UV light. The lamp’s efficiency decreases with age and must be replaced annually. The treatment is effective against many bacterial contaminants but is not effective in reducing Cryptosporidium or cysts like Giardia. As with all treatment systems using a carbon filter, this requires regular replacement. However, UV treatment, like ozonation, is not by itself a water purification system. It does not remove chemicals, solvents or heavy metals. It is used chiefly in commercial operations in a combination with reverse osmosis, or to treat home well water with unacceptable levels of pathogenic bacteria, in combination with carbon filtration or reverse osmosis. Water softeners treat hard water simply by exchanging sodium for calcium and magnesium. This helps soap and laundry detergent dissolve more easily. To function properly, the tank must be periodically flushed (or recharged) with a solution of sodium chloride (salt). Some softeners automatically recharge the tank either on a regular schedule or when an electronic sensor detects that the resin needs to be recharged. With automatic recharge, you only need to keep the sodium storage container filled. Other softeners must be recharged manually and are usually serviced by water treatment companies. Water softeners are not designed for drinking water; they do not purify the water and they introduce high levels of sodium. It is recommended that water softeners be by-passed when installing a drinking water filter. KDF resin is used chiefly to filter chlorine out of water and is primarily employed residentially in shower head and bath filters. Regular replacement of the filtration media is necessary. PrevPreviousHow does a Water Ionizer Work?